By comparing the Chandra observations with those by the NSF's Karl G. Jansky Very Large Array (VLA), Pooley and collaborators explain the observed X-ray emission as being due entirely to the shock wave—akin to a sonic boom from a supersonic plane—from the merger smashing into surrounding gas. There is no sign of X-rays resulting from a neutron star. "At the beginning of my career, astronomers could only observe neutron stars and black holes in our own galaxy, and now we are observing these exotic stars across the cosmos," said co-author Bruce Gossan of the University of California at Berkeley. "What an exciting time to be alive, to see instruments like LIGO and Chandra showing us so many thrilling things nature has to offer." You'd think a science journalist would realise that "last fall" is a very hemisphere specific time designation. I could have sworn it was last spring. The bastards probably did it in meters instead of godly intended cubits! I wonder would this mean the masses of awesomeness "fall in"? or "spring in"? AllStBob, you have a point, but a small one. All the contributors mentioned in the article were associated with universities in the USA, so a northern hemisphere seasonality is a very reasonable assumption. Seems like a potentially false dichotomy and a bit of an assumption. There are only two options? Do we know that for sure? If we don't see the usual signs of the one, then it must necessarily be the other? Really? 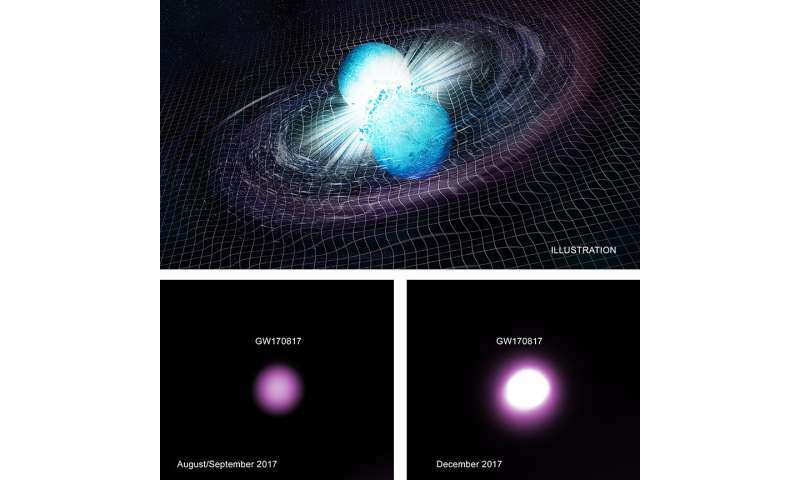 'The spectacular merger of two neutron stars that generated gravitational waves announced last fall' is taken as the Nobel sealed starting assumption for the two adopted alternative explanations for the merged object although both alternatives are against so far proven concepts. The third alternative is to doubt the 2011 and 2017 Nobel 'confirmations' of Dark Energy and NS merge GW results of the outdated GRT and QM theories 100 years ago. The 1995 Dynamic Universe (DU) bounce replacement of BB and GRT in physics foundations is supported by the math inventions of advanced estimation theory in terms of unified matrix and tensor calculus. 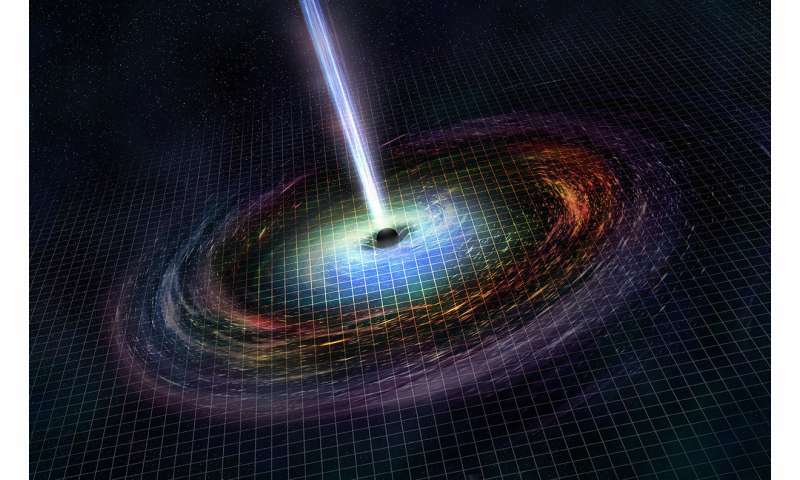 They have explained the flaws in theoretical GW and practical LIGO systems foundations. They question the NS merge GW data interpretation as an additional GRT based mistake in the waste basket of 5-10 other 'proofs' of GRT and traditional quantum theories, see Suntola DU literature at his PFS web site and quantum/string theory of photogrammetry. Why how clever of you, Anonym, to concatenate a random number after your handle to defeat those of us who wish to ignore your crank garbage. What on earth is wrong with you? Maybe you should get out more. No matter this is beyond the constraints of BH theory, I'm sure something dark was involved though. In the light of Suntola's repeated papers countering the GRT based interpretations of 1998 SN1a data with convincing side-by-side comparisons with the DU model (see e.g. 2004-2005 papers) without any need of DE, the 2011 Nobel blessing of 'DE confirmation' appears premature. The 2017 Nobel of 'direct detection of GW' was awarded only days and weeks after latest disputed explanations of the theoretical and engineering foundations to explain the reported assumed GW data events in terms of Mach and DU energy balance principle and in terms of similar past mistakes in the early days of range and image sensing technologies of geodesy and photogrammetry as explained in my 208 blogs of WSU Master Class discussions since fall 2014. Glad to see recent phys.org articles about potential triggers of GRB and GW sources to explain the assumed (fake?) NS merge just weeks/days before the more than premature 10/2017 Nobel decision. Galileo's days are here again!